Block 4 of the Playmates Block of the Month Quilt is London Bridge & measures 24" x 20". 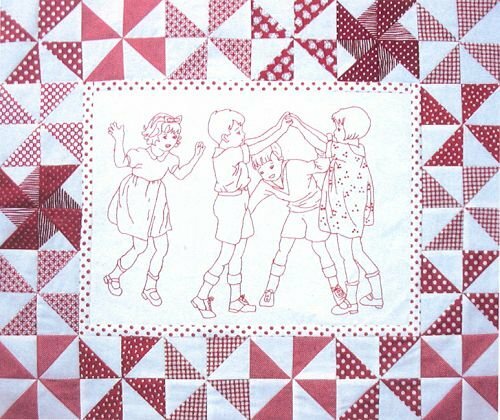 Each redwork block features one of 12 vintage illustrations of children at play drawn by Ruth Caroline Eger that can be made alone for a pillow or wall quilt. Designed by Sandy Klop, each quilt pattern includes full-color instructions for that redwork block surrounded by red & white pinwheels.